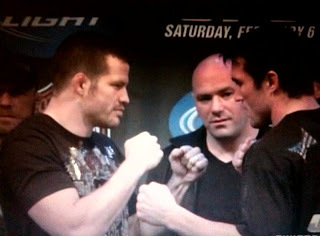 This is Chael and I at the press conference. The funniest thing was talking to Coleman. He told me to knock Chael out for him. Apparently Chael called him a "bum" in an interview. Then at the conference while sitting next to eachother, Chael said he was a fan of Coleman since 1992!